The invention provides a supporting device which is used for supporting an electronic device. The supporting device comprises a base, support portions arranged on the base, and two clamping portions, wherein the two clamping portions are in pivot joint with two opposite ends of the support portions. The base is used for supporting the bottom end of the electronic device. The two clamping portions are used for clamping the electronic device and two side ends, connected with the bottom end, of the electronic device so as to be matched with the base to enable the electronic device to be clamped on the supporting device. 随着电子技术的发展，便携式电子装置，如手机的功能越来越强大。  With the development of electronic technology, portable electronic devices such as mobile phones become more powerful. 目前，大多手机都具有视频播放、电子书浏览等功能。 Currently, most mobile phones with video playback, e-book browsing. 当使用者使用手机观看视频或浏览电子书时，通常需要手持手机或借助于支撑物将手机支撑于支撑面(如桌面)上。 When users use the phone to watch videos or browse e-books, usually by means of hand-held mobile phone or phone support supported on the supporting surface (such as desktop) on. 然而，长时间手持手机时会造成使用者手部酸麻，而将手机放置于桌面则需要寻找合适的支撑物从而使手机使用受限。 However, the user can cause tingling hands when holding the phone for a long time, and place your phone on the desktop you will need to find the right support so that mobile phone use is limited. 有鉴于此，有必要提供一种用于支撑电子装置的支撑装置。  In view of this, it is necessary to provide a support means for supporting the electronic device. 该支撑装置，用于支撑电子装置。  The support means for supporting the electronic device. 支撑装置包括底座、设置于底座上的支撑部及枢接于支撑部相对两端的两个夹持部。 Support apparatus includes a base, a support portion pivotally disposed on the base and connected to two holding portions of the support portions of the opposite ends. 底座用于支撑电子装置的底端。 A base for supporting the bottom end of the electronic device. 两个夹持部用于夹持电子装置与底端相连接的两个侧端以配合底座将电子装置夹持于支撑装置上。 Two holding portions for holding both side ends of the bottom end of the electronic device and connected to the electronic device with the base of the clamp on the support means. 上述支撑装置能够将不同尺寸的电子装置支撑于支撑面上，且允许用户调整电子装置的倾斜角度。  The support means can be of different size electronic device supported by the support surface, and allows the user to adjust the angle of inclination of the electronic device. 图1为本发明一较佳实施方式的支撑装置支撑电子装置时的示意图。  FIG. 1 is a schematic view of a support means for supporting the electronic device of the present preferred embodiment of the invention. 图2为图1所示支撑装置的示意图。  FIG. 2 is a schematic view of the support device 1 shown in FIG. 图3为图1所示支撑装置的分解图。  FIG. 3 is an exploded view of the support device 1 shown in FIG. 图4为图1所示支撑装置沿IV-1V方向的剖视图。  FIG. 4 is a cross-sectional view of the support means along the direction IV-1V of FIG. 1. 图5为图1所示支撑装置折叠时的状态示意图。  FIG. 5 is a state where the folding support apparatus shown in FIG. 1 FIG. 请参阅图1和图2，为一较佳实施方式的支撑装置100夹持电子装置200时的示意图。  Please refer to FIG. 1 and FIG. 2, 100 is a support means holding an electronic device in a preferred embodiment schematic view of the embodiment 200. 该电子装置200在一些实施例中可为手机、PDA、游戏机等。 The electronic device 200 in some embodiments may be a cell phone, PDA, a game machine and the like. 电子装置200包括底端201、前端部202、后端部203及两个侧端204。 Electronic device 200 includes a bottom end 201, 202, 203 and the rear end portion of both side portions distal end 204. 支撑装置100能够夹持不同尺寸的电子装置200，且允许夹持于其中的电子装置200的倾斜角度可调。 Support means capable of holding the electronic device 100, 200 of different sizes, and allows the tilt angle holding therein the electronic device 200 is adjustable. 请一并参考图3和图4，支撑装置100包括本体10、底座20、用于夹持电子装置200的夹持机构30、用于将底座20转动连接于本体10的两个铰链机构40及设置于底座20上的插接件50。  Please refer to FIGS. 3 and 4, the support apparatus 100 includes a main body 10, base 20, a clamping mechanism 30 holding the electronic device 200, for 20 rotatably connected to the base body 10 of the two hinge connector means 40 and 50 provided on the base 20. 本体10大致呈矩形的中空体，其开设有用于收容夹持机构30的收容槽112。  The main body 10 is substantially rectangular hollow body which defines a receiving groove for receiving the holding means 30 112. 本体10在本实施例中为游戏控制台。 In the present embodiment, the main body 10 as a game console. 本体10 —端被切除形成控制台120。 Body 10 - terminal formed console 120 is cut. 控制台120上设置有音箱124、手柄126、操控按钮128等直接或间接与插接件50电性连接的电子元件。 It is provided with a speaker 124, a handle 126 on the console 120, control button 128 and other electronic components directly or indirectly connected to the connector 50 electrically. 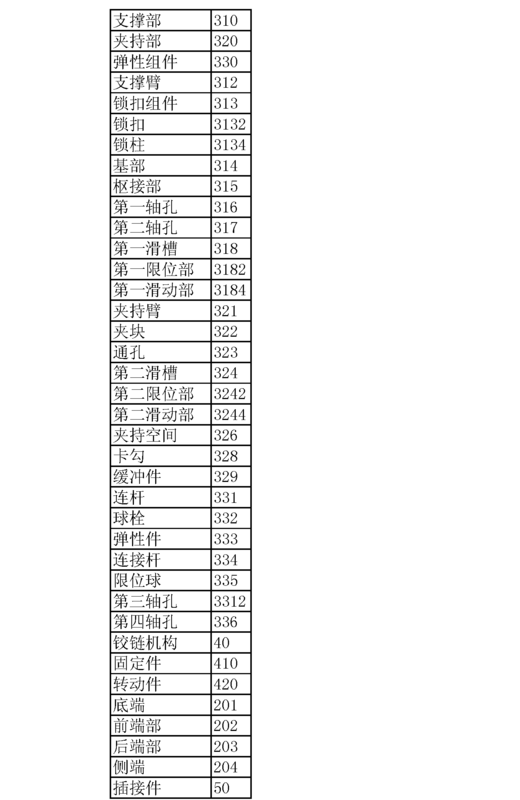 收容槽112远离控制台120的侧壁114的中部断开形成开口116。 Central receiving slot 112 away from the side wall 114 of the console 120 an opening 116 is formed off. 两个铰链机构40设置于收容槽112的底部且大致与开口116相对应。  two of the hinge mechanism 40 is provided at the bottom of the receiving groove 112 and the opening 116 substantially correspond. 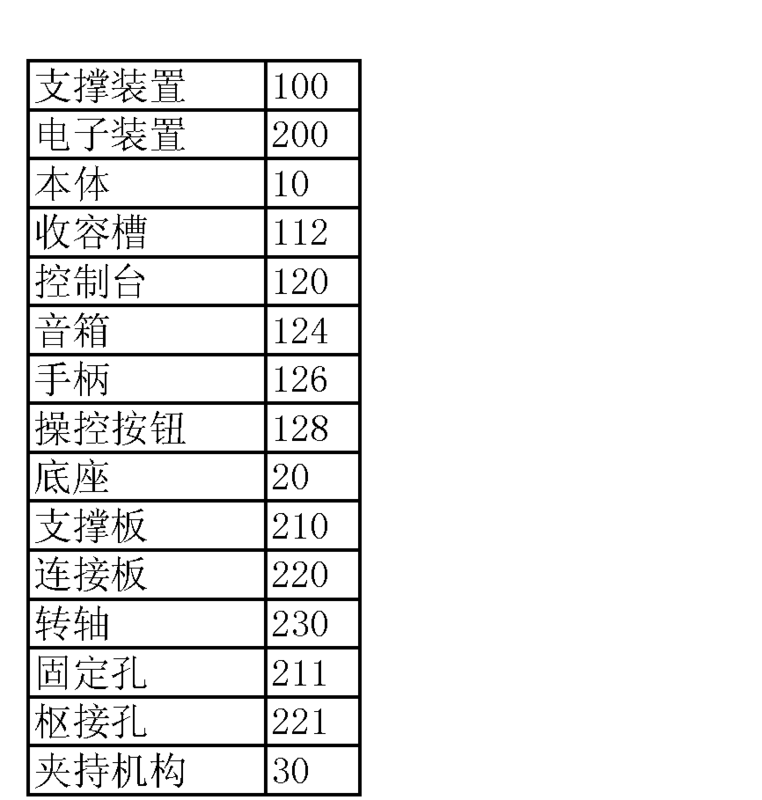 每一个铰链机构40均包括固定于收容槽112底部的固定件410及转动连接于固定件410上的转动件420。 The fixing member 410 and the rotating member 410 is rotatably connected to the fixed member of each of the hinge mechanism 40 includes a housing secured to the bottom 420 of the groove 112. 底座20用于支撑电子装置200的底端201。  The base 20 for supporting the bottom end 201 200 of the electronic device. 底座20包括支撑板210、自支撑板210一侧缘垂直延伸而成的连接板220及固定于连接板220上的两根转轴230。 The base 20 includes a support plate 210, support plate 210 extends from the web side edge 220 formed perpendicular to the two axes of rotation and fixed on the coupling plate 220,230. 支撑板210相对两端开设有若干固定孔211。 The opposite ends of the support plate 210 defines a plurality of fixing holes 211. 连接板220远离支撑板210的一端开设有两个枢接孔221。 One end of the connecting plate 220 away from the support plate 210 defines two pivot holes 221. 枢接孔221沿垂直于连接板220的方向延伸。 Pivot hole 221 extending in a direction perpendicular to the direction of web 220. 转轴230收容于枢接孔221。 Pivot shaft 230 received in the hole 221. 插接件50垂直设置于支撑板210上且大致与连接板220平行。  The connector 50 is provided perpendicular to and substantially parallel to the upper support plate 220 and the connecting plate 210. 插接件50在本实施例中为与电子装置200外部接口(未示出)相适配的插头，用于将夹持于支撑装置100上的电子装置200电连接至其它外接设备，例如，电脑、游戏控制台等。 In the connector 50 of the present embodiment, the external interface 200 (not shown) adapted to plug the electronic device, means for clamping the support on the electronic device 200 is electrically connected to other external devices 100, e.g., computers, game consoles. 夹持机构30枢接于连接板220。  clamping mechanism 30 pivotally connected to the connecting plate 220. 夹持机构30包括支撑部310、转动连接于支撑部310相对两端的两个夹持部320及连接支撑部310与两个夹持部320的两个弹性组件330。 Clamping mechanism 30 includes a support portion 310, two holding portions rotatably connected to the support portions 310 and 320 connected to opposite ends of the support portions 310 and two elastic portions 320 of the two gripping assemblies 330. 支撑部310抵接于电子装置200的后端部203。 The support portion 310 abuts against the rear end section 203 of the electronic device 200. 夹持部320用于夹持电子装置200与两个侧端204，并配合支撑部310及底座20的支撑板210将电子装置200夹持于支撑装置100。 Holding portion 320 for holding the electronic device 200 and the two side ends 204, and the supporting portions 310 with the support plate 20 and the base 210 of the clamp 200 of the electronic device 100 to the support means. 弹性组件330用于当夹持部320相对支撑部310转动时提供一弹性回复力以驱动两个夹持部320相向运动进而夹紧电子装置200。 When the elastic member 330 for providing a resilient holding portion 310 is rotated relative to the support portion 320 restoring force to drive the two clamp portions 320 move toward each other and thus clamping the electronic device 200. 支撑部310包括两个大致呈L形的支撑臂312及锁扣组件313。  The support portion 310 includes two substantially L-shaped support arm 312 and the latch assembly 313. 两个支撑臂312分别通过两根转轴230转动连接于连接板220，从而使两个支撑臂312能够从相互靠拢且垂直于支撑板210的第一位置转动至相互分开且平行于支撑板210的第二位置。 Two support arms 312 are rotated by the rotation shaft 230 is connected to two connecting plate 220, so that the two support arms 312 to the support plate 210 can be closer to each other and perpendicular to the support plate 210 is rotated to a first position apart from each other and parallel the second position. 每一个支撑臂312均包括基部314及自基部314 —端垂直弯折而成的枢接部315。 Each support arm includes a base portion 312 from the base 314 and 314-- pivoting end of the vertical portion 315 formed by bending. 基部314远离枢接部315的一端开设有沿平行于转轴230方向延伸的第一轴孔316。 Away from the base portion 314 at one end 315 of the pivoting portion defines a first shaft hole 230 is parallel to the rotation axis 316 extending in the direction. 枢接部315远离基部314的一端开设有沿平行于转轴230方向延伸的第二轴孔317。 315 pivot away from the base end portion 314 defines a second bore axis 230 is parallel to the rotation axis 317 extending along. 基部314面向枢接部315的侧壁开设有第一滑槽318。 Pivoting base portion 314 facing the side wall defines a first portion 315 of the chute 318. 第一滑槽318沿平行于枢接部315方向的横截面大致呈T形，其包括第一限位部3182及与第一限位部3182相连通的第一滑动部3184。 A first chute 318 to 315 along a direction parallel to the pivot portion is substantially T-shaped cross section, which includes a first sliding portion 3182 and the first limiting portion limiting the first communicating portion 3182 of 3184. 第一限位部3182的尺寸要大于第一滑动部3184的尺寸。 Limiting the size of the first portion 3182 is greater than the size of the first portion 3184 of the slider. 如图2所示，锁扣组件313用于当两个支撑臂312转动至相互靠拢的第一位置时将两个支撑臂312锁合在一起。 2, the latch assembly 313 is used when both the support arm 312 is rotated to a first position closer to each other of the two support arms 312 will be locked together. 锁扣组件313包括转动连接于其中一个支撑臂312上的锁扣3132及固定于另一个支撑臂312上的锁柱3134。 Latching assembly 313 comprises a rotatably supported latch which is connected to the arm is fixed to the lock cylinder and 3,123,132 on the other support arm 3,123,134. 锁扣3132可扣合于锁柱3134以将两个支撑臂312锁合在一起。 Latch 3132 can be engaged with the lock cylinder 3134 to the two support arms 312 lock together. 夹持部320包括两个夹持臂321及分别设置于夹持臂321上的两个夹块322。  clamping portion 320 includes two clamping arms and two are disposed on the clamp arm 321 of clamp block 321 322. 两个夹持臂321分别枢接于两个枢接部315且与两个支撑臂312共面设置。 Two clamp arms 321 are pivotally connected to two pivot portions 315 and 312 is provided with two coplanar with the support arm. 夹持臂321的长度小于支撑臂312的长度。 The length of the clamping arm 321 is less than the length of the support arm 312. 两个夹块322分别固定于两个夹持臂321远离枢接部315的一端。 Two clamp blocks 322 are fixed to one of the two clamping arms 321 away from the pivot portion 315. 每一个夹持臂321的相对两端均开设有通孔323。 Each of the opposite ends of the clamping arms 321 are defined in a through hole 323. 每一个夹持臂321还开设有与第一滑槽318相对应的第二滑槽324。 Each clamp arm further defines a second sliding slot 321 has a chute 318 corresponding to the first 324. 第二滑槽324的结构与第一滑槽318的结构相同，其包括第二限位部3242及与第二限位部3242相连通的第二滑动部3244。 A second chute structure 324 with the first sliding slot 318 of the same configuration, which includes a second sliding portion and the second limiting portion 3242 and second portion 3242 are connected through the stopper 3244. 第二限位部3242的尺寸要大于第二滑动部3244的尺寸。 Limiting the size of the second portion 3242 is larger than the size of the second sliding portion 3244. 两个夹块322分别固定于两个夹持臂321远离枢接部315的一端且伸出于夹持臂321及支撑臂312所在的平面。 Two clamp blocks 322 are fixed to one of the two clamping arms 321 pivot away from the projecting portion 315 and to the plane of the support arm 321 and clamp arm 312 is located. 两个夹块322相互对应且与底座20的支撑板210其同形成一个用于夹持电子装置200的夹持空间326。 Two clamp blocks 322 corresponding to each other and to the base 210 of the support plate 20 which is formed with a holding space for holding the electronic device 200 326. 两个夹块322远离夹持臂321的一端相向弯折形成两个用于夹持电子装置200前端部202的卡勾328。 One end of the two clamping blocks 322 facing away from the clamping arm 321 is bent to form an electronic card for gripping two distal portions 200,202 of hook apparatus 328. 两个夹块322相互正对的内侧壁还分别设置有缓冲件329 (例如，海绵垫)，用于当支撑装置100夹持电子装置200于其中时避免夹块322夹伤/刮伤电子装置200的外壳。 Two side walls facing each other inside the clamp block 322 are further provided with a buffer member 329 (e.g., a sponge pad), when the support means 100 for holding therein the electronic device 200 to avoid pinch clamp block 322 when / scratch electronic device housing 200. 在本实施例中，每一个支撑臂312及每一个夹持臂321均由两个呈轴对称分布的部分固定而成，其中，每一个支撑臂312相对垂直于转轴230的一个平面(未示出)呈轴对称以将基部314、枢接部315及开设于基部314上的第一滑槽318平均分成两部分；每一个夹持臂321相对垂直于转轴230的一个平面(未示出)呈轴对称以将第二滑槽324平均分成两部分。  In the present embodiment, each of the support arms 312 and 321 each clamp arm formed by two form part of the fixed axis symmetrically, wherein each supporting arm 312 relative to a plane perpendicular to the shaft 230 (not shown) in axial symmetry to the base 314, pivot portion 315 defines a first chute, and the average base divided into two portions 314,318; each of gripping arms 321 relative to a plane perpendicular to the shaft 230 (not shown) to a second axially symmetric average chute 324 into two parts. 每一个弹性组件330均包括一根连杆331、转动连接于连杆331相对两端的两个球栓332及分别连接于两个球栓332的两个弹性件333。  Each assembly 330 comprises a resilient rod 331, the ball pin rotatably connected to the two opposite ends of the links 331 and 332 are connected to two ball pin in two resilient members 333,332. 连杆331相对两端设置有第三轴孔3312。 The opposite ends of the link 331 is provided with a third shaft hole 3312. 球栓332包括连接杆334及设置于连接杆334 —端的限位球335。 Ball 332 includes a plug 334 and connecting rod 334 is provided to the connecting rod - terminal ball stopper 335. 连接杆334远离限位球335的一端开设有第四轴孔336。 Stopper 334 remote from the ball end 335 of connecting rod 336 defines a fourth shaft hole. 限位球335大致呈球状，其尺寸大小均小于第一限位部3182及第二限位部3242的尺寸大小，但大于第二滑动部3244及第二滑动部3244的尺寸大小。 Limit substantially spherical ball 335, which is smaller than the size of the average size of the first stopper 3182 and the second portion of the stopper portion 3242, but greater than the second sliding portion 3244 and the size of the second sliding portion 3244. 两个弹性件333在本实施例中为大致呈圆柱形的螺旋弹簧，其直径小于小于第一限位部3182及第二限位部3242的尺寸大小，但大于第二滑动部3244及第二滑动部3244的尺寸大小。 Two elastic members 333 in the present embodiment is a substantially cylindrical helical spring, which is smaller than the size of a smaller diameter than the first stopper 3182 and the second portion of the stopper portion 3242, but greater than the second sliding portion 3244 and the second size of the sliding portion 3244. 如图3和图4所示，组装时，首先，将铰链机构40的固定件410固定于收容槽112的底部，以及将底座20的支撑板210固定至铰链机构40的转动件420。  FIGS. 3 and 4, in assembly, firstly, the fixing member of the hinge mechanism 40, 410 is fixed to the receiving groove bottom portion 112, and the base support plate 20, 210 is fixed to the rotary member 420 of the hinge mechanism 40 . 将其中一个弹性件333 (以下称第一弹性件)收容于第一限位部3182，并将其中一个球栓332的限位球335固定至第一弹性件远离枢接部315的一端后收容于第一限位部3182中；以及将另外一个弹性件333 (以下称第二弹性件)收容于第二限位部3242，并将另一个球栓332的限位球335固定至第二弹性件远离夹块322的一端后收容于第二限位部3242中。 In which a resilient member 333 (hereinafter referred to as a first elastic member) housed in the first restraining portion 3182, wherein a ball and a stopper pin 332 fixed to the ball 335 away from the first elastic member 315 is pivotally connected at one end portion of the housing the first restraining portion 3182; and an additional elastic member 333 (hereinafter referred to as the second elastic member) housed in the second stopper section 3242, and the other ball stopper pin 332 is fixed to the second elastic ball 335 after the end of the block remote from the grip member 322 is received in the second portion 3242 of the stopper. 然后，将支撑臂312的两部分装配在一起后转动连接于转轴230，以及将夹持臂321装配在一起后转动连接于枢接部315的第二轴孔317。 Then, the supporting arm 312 of the two parts together after assembly rotatably connected to the rotation shaft 230, and the rotation of the second shaft hole 315 is connected to the pivot portion 317 with the clamp arm assembly 321. 最后，将插接件50固定至支撑板210。 Finally, the plug member 50 is fixed to the support plate 210. 使用时，如图1所示，将支撑臂312转动至第一位置并通过锁扣组件313将支撑臂312锁扣在一起；转动夹持臂321以使电子装置200的两侧端204能夹持于两个夹块322之间，并使电子装置200的底端201的接口插接于插接件50。  In use, as shown in FIG. 1, the rotation of the support arm 312 to the first position by the latch assembly 313 and the support arm 312 latch together; clamp arm 321 is rotated so that both ends of the electronic device 200 block 204 can be sandwiched between the two clips 322, the electronic device 200 and the bottom 201 of connector interface 50 to the plug member. 弹性件333因夹持臂321相对支撑臂312转动而被限位球335压缩，因此，当电子装置200夹持于夹块322之间时，弹性组件330因恢复形变而提供一弹性回复力以驱使两个夹块322相向运动而夹紧电子装置200，从而将电子装置200夹持于支撑装置100。 The elastic member 333 by the rotation of the support arm 312 relative to the clamp arm 321 is a compression stopper ball 335, thus, when the block is between 322,200 to the clip holding the electronic device, due to the elastic recovery of deformation assembly 330 to provide a resilient force to two opposing clamp block driven by the movement of the clamp 322 of the electronic device 200, thereby holding the electronic device 200 to the support means 100. 此外，由于底座20通过铰链机构40转动连接于本体10，因此，当电子装置200夹持于支撑装置100后，还可通过转动底座20来调整电子装置200的倾斜角度从而使用户可根据需要调整电子装置200的视角。 Further, since the base 20 by a hinge mechanism 40 rotatably connected to the main body 10, and therefore, when the electronic device 200 holding the support means 100, the tilt angle may be adjusted by rotating the electronic device 200 so that the base 20 can be adjusted according to user need Angle of the electronic device 200. 如图5所示，当不使用电子装置200时，将电子装置200从支撑装置100上取下。  As shown in FIG 5, when not in use the electronic apparatus 200, the apparatus 200 is removed from the support 100 of the electronic device. 通过锁扣组件313解锁两个支撑臂312，并使两个支撑臂312转动至第二位置以收容于收容槽112中。 Unlocking the latch assembly 313 by two support arms 312, and two support arms 312 to a second rotational position received in the receiving groove 112. 借助于上述支撑装置100，不仅能够将不同尺寸的电子装置200支撑于支撑面上，还允许用户调整电子装置200的倾斜角度。  With the above support apparatus 100, not only to the different sizes of the electronic device 200 is supported on the support surface also allows the user to adjust the tilt angle 200 of the electronic device. 此外，当不使用支撑装置100时，支撑装置100还能折叠起来以方向用户携带。 Further, when the support means 100 is not used, the support apparatus 100 can be folded in a direction carried by a user. 综上所述，尽管为说明目的已经公开了本发明的优选实施例，然而，本发明不只局限于如上所述的实施例，在不超出本发明基本技术思想的范畴内，相关行业的技术人员可对其进行多种变形及应用。  In summary, although there have been disclosed for illustrative purposes preferred embodiments of the present invention, however, it is not only limited to the embodiments described above of the present invention, without departing from the basic technical idea of ​​the scope of the invention, related industries art can be a variety of modifications and applications. 1.一种支撑装置，用于支撑电子装置，该支撑装置包括底座及设置于底座上的支撑部，底座用于支撑电子装置的底端，其特征在于:支撑装置还包括枢接于支撑部相对两端的两个夹持部，两个夹持部用于夹持电子装置与底端相连接的两个侧端以配合底座将电子装置夹持于支撑装置上。 1. A support apparatus for supporting an electronic device, the device comprising a support base and a bottom portion disposed on the base support, a base for supporting the electronic device, wherein: the support means further comprises a support portion pivotally connected to two opposite ends of the clamping portions, the two holding portions for holding both side ends of the bottom end of the electronic device and connected to the electronic device with the base of the clamp on the support means. 2.如权利要求1所述的支撑装置，其特征在于:每一个夹持部均包括夹持臂及夹块，夹持臂一端转动连接于支撑部，夹块固定于夹持臂的另一端，两个夹块相互正对与底座共同形成一个用于夹持电子装置的夹持空间。 2. The support device according to claim 1, wherein: each gripping portion includes a clamp block and a clamp arm, the clamp arm rotatably connected to the support portion at one end, the other end is fixed to the clamp block clamp arm , two clamp block facing each other and the base together form a holding space for holding the electronic device. 3.如权利要求2所述的支撑装置，其特征在于:支撑装置还包括两个弹性组件，每一个弹性组件的一端连接于支撑部，另一端连接于夹持臂，用于当两个夹持臂相对支撑部沿相反的方向转动时提供一弹性回复力以驱使两个夹块相向运动。 3. The support device according to claim 2, characterized in that: the support means further comprises two elastic member, one end of each elastic element is connected to the support portion and another end connected to the clamping arm, for, when two clip providing a resilient holding arm is rotated relative to the direction of the support portions in an opposite return force to drive the two clamp blocks moved towards each other. 4.如权利要求3所述的支撑装置，其特征在于:每一个弹性组件均包括连杆、转动连接于连杆相对两端的两个球栓及分别连接于两个球栓的两个弹性件。 4. The support device according to claim 3, wherein: each of the resilient assembly comprises a link, the link is rotatably connected to opposite ends of the two balls and two resilient plug member are connected to two ball plug . 5.如权利要求4所述的支撑装置，其特征在于:支撑部相对两端分别开设有第一滑槽，第一滑槽用于收容其中一个弹性件与该其中一个弹性件相连接的其中一个球栓；夹持臂开设有与第一滑槽相对应的第二滑槽，第二滑槽用于收容另一个弹性件及与该另一个弹性件相连接的另一个球栓。 Wherein the supporting portion defines two opposite ends a first chute, wherein the first chute for receiving a resilient member connected to the resilient member is one of: 5. The support apparatus according to claim 4, characterized in that a ball plug; clamp arm defines a second slot corresponding to the first chute, a second chute for receiving the other ball pin and the other elastic member with the other elastic member is attached. 6.如权利要求3所述的支撑装置，其特征在于:支撑部包括两个支撑杆，两个支撑杆均枢接于底座并可相对底座从垂直于底座且相互靠拢的第一位置转动至平行于底座且相互分开的第二位置。 6. The support device according to claim 3, wherein: the support portion comprises two support rods, two supporting rods are pivotally connected to the base and is rotatable relative to the base from a first position perpendicular to the base and to move towards each other parallel to the base and a second position spaced from each other. 7.如权利要求6所述的支撑装置，其特征在于:支撑部还包括锁扣组件，用于将两个支撑杆锁定于第一位置。 7. The support device according to claim 6, wherein: the support portion further includes a latch assembly for locking the two support rods in a first position. 8.如权利要求6所述的支撑装置，其特征在于:每一个弹性组件两端分别连接于支撑杆和夹持杆。 The supporting device as claimed in claim 6, wherein: each elastic element are connected to both ends of the support bar and the clamping bar. 9.如权利要求8所述的支撑装置，其特征在于:该支撑装置还包括本体及设置于本体上的铰链机构，底座通过铰链机构转动连接于本体以允许夹持于支撑装置上的电子装置的倾斜角度可调。 9. The supporting device according to claim 8, wherein: the supporting device further comprises a main body and a hinge mechanism provided on the body, the body rotatably connected to the base by a hinge mechanism to allow the electronic device clamped on the support means the inclination angle is adjustable. 10.如权利要求9所述的支撑装置，其特征在于:本体设置有收容槽，收容槽用于当两个支撑杆转动至第二位置时收容两个支撑杆及夹持部。 10. The support device according to claim 9, wherein: the body is provided with a receiving groove, the receiving groove for accommodating two support bars and two support rods holding portion when rotated to a second position.